The Xbox One's exclusive fighting game Killer Instinct gets a huge update today with another character from the original arcade and Super Nintendo classic's line-up. 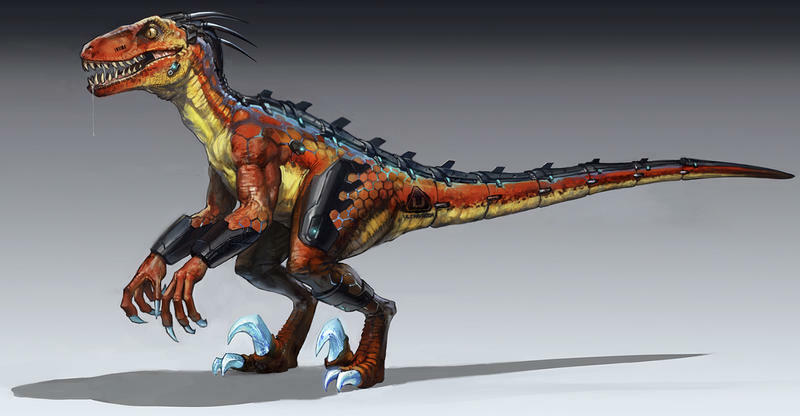 Riptor, the velociraptor, will be rejoining her foes on the battlefield, but this time, she has been decked out with some sweet cybernetic enhancements. Some might not like the redesign, calling it a bit too new-agey, but it's not like Riptor was a wholly original idea either. I don't think it's wrong to say that she was added to the game to capitalize on the Jurassic Park craze which was happening at the time. These enhancements give her a unique edge that the original didn't have. Beyond that, her entire moveset has been preserved except for the "upperclaw" move, which has been replaced by a attack called "clever girl." How much more 90s can it get up in this game? Am I the only one who finds it weird that we are seeing Riptor again as the Jurassic World trailer is making the rounds? Seriously! Sadly though, with Riptor releasing today, that leaves only one more character, Cinder, from the classic line-up. Half the fun of this new Killer Instinct game is seeing each of the classic characters redesigned for the modern age, and for the most part, it has worked very well. Once we get a first look at Cinder though, it's all over, and we have just original characters and Killer Instinct 2 exclusives left. Take your time, Microsoft. I want this nostalgia trip to last.